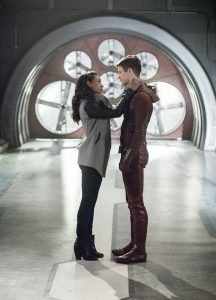 A big event in this year’s four-show DC TV crossover, airing November 27 and 28 on The CW, is the long-awaited wedding of Barry Allen and Iris West. 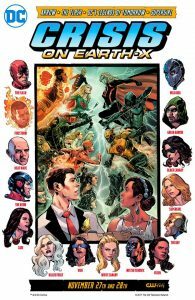 In the comic books, their wedding was interrupted by the Reverse-Flash… this year, there may be even more interruptions! On a recent visit to the Flash set in Vancouver, BC, FlashTVNews was part of a group that was able to talk to Candice Patton about the upcoming big event for “WestAllen”… starting with the declaration that fans have waited long enough. “I think it’s time,” Candice said. “I think that fans have been waiting for three years. It’s been a long time coming. They’ve had other partners, relationships, trials, tribulations and so I think it’s time. I think Season 4 is a good time for them to kinda make it all happen… the Wedding of the Century, essentially,” she said. The crossover comes as part of this big crossover and that is something Patton describes as “a really cool thing.” Of course, who knows what will happen. You can see the video interview, where Candice talks about the Monique Lhuillier dress that Iris will wear, who she will interact with in the crossover, and whether or not there will be drooling over Oliver Queen, below. Keep your eyes open for Candice’s adorable dog Zoe! Craig Byrne began writing about TV on the internet in 1995, and has since had several books published, including the official Smallville companion books. In addition to running KSiteTV, he is webmaster of several spin-off sites, including KryptonSite, GreenArrowTV, SHIELDsite.net, and FlashTVNews.